Sara loves living next door to her best friend, Nadine Ando on their cul-de-sac in Surrey, British Columbia, Canada. The two girls are inseparable, and Sara is looking forward to starting grade seven and experiencing all the milestones of the last year of elementary school with her best friend by her side. It comes as a huge shock, therefore, when Nadine drops the bombshell that she will actually be skipping a grade and going to high school (grade eight) a year early. Sara feels utterly betrayed by this news, and, over the school year, makes a host of mistakes as she tries to come to terms with the changes happening in her life. I really like the writing style in this middle grade novel, a review copy of which I received from the publisher via Edelweiss. The writing is descriptive, but also conversational, and the author (herself an actress and occasional screenwriter) writes many sections as though she is writing stage directions in a play. There are lots of details about Korean culture (Sara's family) and Japanese culture (Nadine's family), including food and family traditions associated with both, and Sara's city of Surrey also comes to life as wonderful place to grow up. Sara herself is very much like I was in seventh grade: annoying without meaning to be, clingy to friends in an irritating way, and convinced of her own maturity despite being very immature. Though some reviews have indicated that this immaturity makes it hard to believe in Sara as a realistic character, I found her completely (and embarrassingly) authentic. Especially true-to-life is Sara's use of her friendship with Nadine's one-year-younger sister, Jen, to make Nadine jealous, and her brief flirtation with the "in" crowd. The only thread of the story that gave me pause was the subplot involving a local boy who goes missing. I thought early on that this was going to be a main part of the plot, but it wound up being just part of the scenery. I think the way the author uses it works well enough, but because it caught my interest early on, it was a little disappointing to realize that there really wasn't a mystery element after all. I think it's also important to note that this book is set in the 1990s. There is a reference to Cabbage Patch Kids in chapter one that tipped me off, and other things, including some of the slang the characters use, and the lack of mobile devices, confirmed my suspicion. I don't think the time period has much impact on the ability of kids to enjoy the story, but it's worth pointing out to kids who might be particularly interested in preteen life 20 years ago. 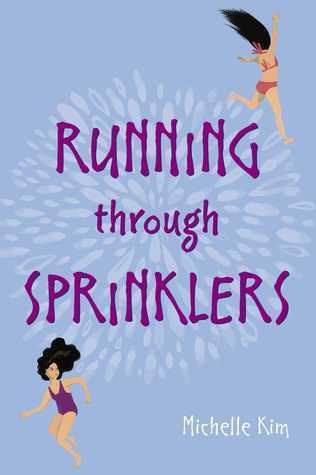 Running Through Sprinklers reminds me of The Battle of Darcy Lane, Tara Altebrando's novel about the struggles of female friendship in early adolescence. It also reminds me a little bit of Judy Blume's books (especially when it comes to bras and periods) and Carol Weston's series about Ava and Pip. I would probably recommend it for ages 10-13, as this is the age group most likely to be going through difficult transitions in friendships for the first time. This one sounds so interesting. Great review, Katie!